Heat oven to 400°F. Wash leeks; remove any tough outer leaves. Trim roots from white bulb portion; cut leeks lengthwise and wash well. Cut crosswise into 1/2-inch-thick slices to make about 4 cups; set aside. Place pie crust in 9-inch glass pie pan as directed on box for One-Crust Filled Pie. Partially bake crust 8 minutes or until very lightly browned. Meanwhile, in 12-inch skillet, melt butter over medium heat. Add leeks; cook 7 to 9 minutes, stirring frequently, until tender but not brown. Remove from heat; set aside. In small bowl, beat eggs with wire whisk. Stir in milk, cheese, salt, pepper and nutmeg until blended. Stir in cooked leeks. Pour mixture into partially baked crust. 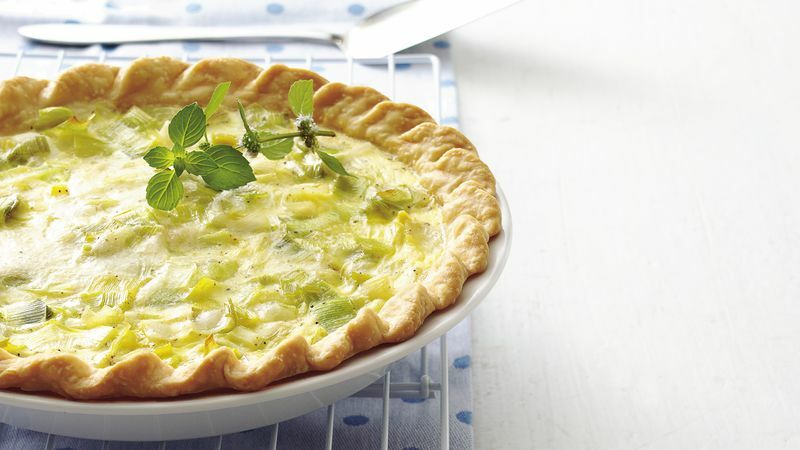 Bake quiche 10 minutes. Cover crust edge with strips of foil to prevent excessive browning. Reduce oven temperature to 300°F; bake 20 to 25 minutes longer or until knife inserted in center comes out clean. Cool 15 minutes before serving. Leeks look like giant green onions and are related to both onions and garlic. Choose leeks that are firm and bright colored with an unblemished white bulb portion. Smaller leeks will be more tender than larger ones.